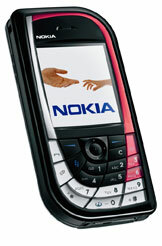 Update: The Nokia 7610 is now available in most locations. Amazon.com is selling the phone for just $299 after rebate. Cingular has started a soft launch of the Nokia 7610. Despite being shipped in most of the world back in June (and announced back in March! ), the Nokia 7610 is new to the US. Features of the Nokia 7610 include: * Bluetooth * Megapixel camera (1152 X 864) with 4x digital zoom * MP3 player * 8MB user memory and reduced size 64MB MMC Card * Series 60 device Currently only a limited number of zip codes show the Nokia 7610 for sale on the Cingular.com webstore. Expect to pay $449.99 with a 2-year contract. Ed. note: if your zip code shows the Nokia 7610 for sale, let us know. We're looking for the pattern.